Since the last one was a blast well, why not a Mk.II ? 8 wheels, any era, any country or scale. I'd be up for another 8x8 campaign... I have a Trumpter BTR 70 in the stash that is overdue an outing. I'm in for sure!!!!!!!!! great idea, and the last 8x8 was a blast as well, couldn't agree more with the proposal and idea! There's a Dragon BTR-80 with a Nona conversion sitting on my shelf needing an excuse to build. Count me in. I'm in also. I've got a PLA Snow Leopard just for the occasion. I'm IN. Dragon SdKfz 234/1 with some PE, mixed wheels, etc. Or maybe a CyberHobby 234/3 w/ 2cm schwebelafette. I'm READY for this one! I'm in with a Boxer, LAV 25 or ASLAV PC. I'm in also, but I don't know yet what I'll be build. 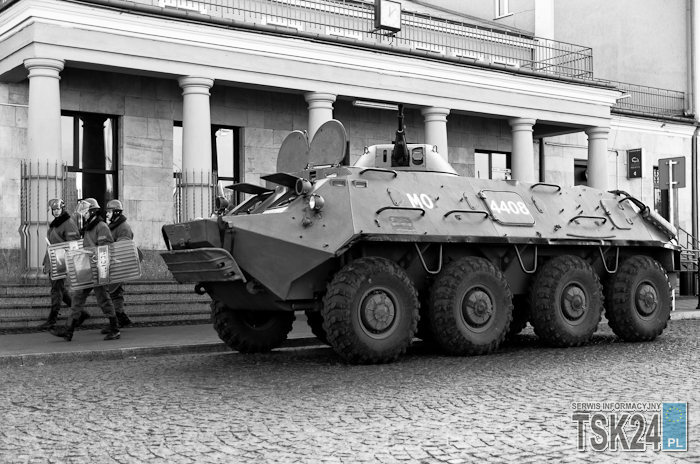 I think about BTR-60PB Polish Milicja the period of martial law 1980 - 1983. Rectification, gentlemen. Martial law in Poland lasted from 1981 to 1983 I made a mistake, I'm sorry. Any chance that an 8x8 started in the last campaign can be finished in this one???? Really don't know what the rules are on that question. No, if you started it already you can join the "Unfinished Business 2015" Campaign for unfinished builds. On Michael's question... it's not my campaign, not my rules but if a build was started and documented in the first part, I could live with seeing it continued here. But as I said, I'm not making the rules here. Any chance on starting the campaign this coming weekend? Or at least allowing early starts? I'm in. May I build an French EBR-11? It has 8 wheels, doesn't it? Yeah, it does (have 8 )... But they don't all touch the ground (in road usage)! The EBR doesn't know whether it wants to be a 4- or 8-wheeler! An 8-wheel switch-hitter! For that matter, the Russian BRDM is - at least most versions - an 8-wheeler, too, albeit some of those are tiny things! Maybe the tiny hi-centering wheels should count only as "halvsies"... making the BRDM more like a "6-wheel-equivalent" vehicle! Funnin' aside, the EBR kts are, IMHO, pretty nice and it certainly is an interesting and different subject! Sim !! Yes !! Oui !! Si !! Da !! Ja !! You can count me in with an 8-RAD sometime. 14, I'll send the proposal. Hope it gets accepted. you know what would be a fun twist, add in a 6X6 build as well, there are some really cool variations and vehicles in the 6x6 segment and category. Got the ok !!!! YES ! Rules & Regs and ENLIST ! !